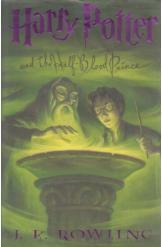 Harry Potter and the Half Blood Prince by JK Rowling Book 6. Sixth year students learn to Apparate, teenagers flirt and fight and fall in love. Harry searches for the full and complex story of the boy who became Lord Vlodemort and find is only vulnerability.